Hello there folks, how is the start of your week going? I took these photos when we went to the ocean park yesterday. I thought that these huge flowers aren't real but they are. If you want to join the fun, just click the badge above. 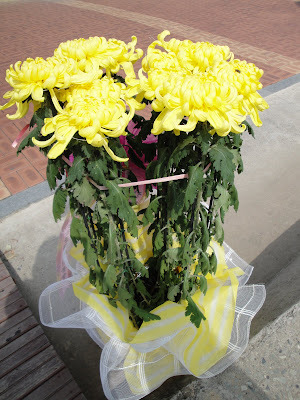 I don't know how Koreans can grow this kind of flowers with this huge size. HI Rose, thanks for the links, I did vote and I will vote agian tomorrow morning, it's the first thing I'll do when I wake up lol!! before my demanding cheeky things wakes up lol!! school holiday kasi eh, it's so exhausting, dami kong mga bisitas, may mga sleep over pa.. hayyy... lovely pic of rylie I wish her luck, she's deserving na manalo siya. i hope you enjoyed your Ocean park adventure! It is pretty yellow flower Chubz...Welcome to MYM! What a great macro shot and a beautiful color of yellow. These are really beautiful flowers!! wow ang ganda sis. drop by si ako, nag vote for the princess today. golden indeed. i thought you posted some jewelries but yet these are flowers are equally beautiful. That flower is so beautiful, I love yellow flowers anyway. Thank you for coming by. Ang dami mo ng meme bakla, you have mellow yellow rin pala nice flower. i sent nga pala sa ym the code for photohunt button. wow, those are huge and very pretty indeed! sarap sa mata ng yellow no? Gorgeous yellow flowers, they are huge. Thanks for visiting. Your kids are so cute, enjoy them when you can. 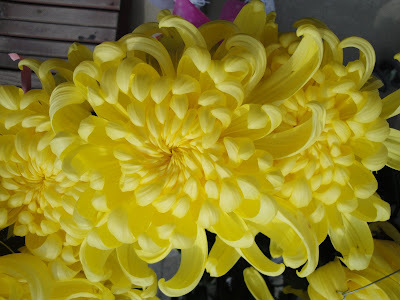 I like the chrysanthemum. One of my fav flowers, though almost every flower is my fav. love the color! Your site is very interesting! ganda! They're so beautiful,Ate Rose! !^_^Nice yellow entry!! beautiful flowers and perfect for Mellow Yellow!